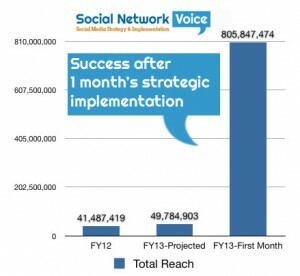 Successful implementation of social media strategy vastly out-performs expectations. The key to success in any social media effort is engagement. In other words, the percentage of people who respond to posts is the strongest indicator of effectiveness. We can measure engagement through Page Likes, Likes, Comments, Shares and Total Reach among other metrics. 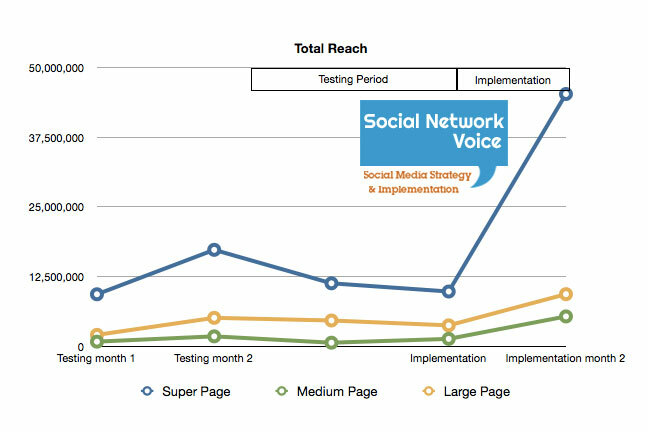 The graphs below show engagement metrics across several different pages and multiple organizations during a testing period, and later implementation. Page Likes: the number of unique individuals who have liked your page (fans). Likes: the number of times your content has received a like. Comments: the number of unique individuals who have commented on your content. Shares: the number of unique individuals who have shared your content. Total Reach: the number of unique individuals who have actually seen your content on your page, in their newsfeed, or on friend’s timelines. 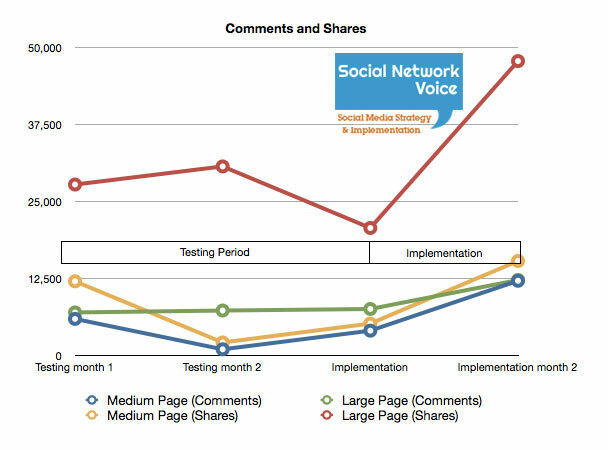 Growth in Facebook comments and shares after strategy implementation and a testing period. In our tests, the medium sized page was left alone with no change in posting content or frequency as a control. The large page was subjected to a variety of post content and post frequency. The same post frequency, but different types of content were implemented. Again in our tests, a medium sized and a large page were the control, while the super page was tested. Once the strategy was implemented, the Super page responded more aggressively due to the already engaged audience. In this graph, Total Reach is highlighted. While the the super page (approximately 2-million fans) already had a Total Reach of over 6-times its size, it grew to nearly 25-times its size. A page’s reach has a strongly positive effect on Page Likes. The two graphs below show two similarly populated small pages experiencing similar growth in fans (Page Likes) over the course of a very short testing period (9 days). In this case the content strategy was what drove the increase in fans. Both pages experienced an approximate 1% growth in fans over the 9-day testing period, while a control page (not shown) actually showed a 1% decrease in target audience Page Likes during the same period. The importance of testing cannot be stressed enough. Even in just a few days, it is possible to see change. While testing over a more prolonged time period provides greater refinement to implement a strategy, any testing is beneficial. Ready to learn more or get started? Give us a shout!